© Copyright - Alexia Vassiliou / Performance Street (885767171510). 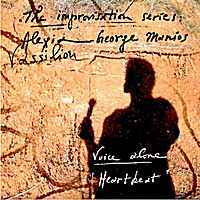 Voice improvisations performed in Thessaloniki, the capital of Northern Greece, at one of my favourite studios, George Manios recording studio on Egnatias road, in the center of old Thessaloniki! Then George Manios the owner of the studio and sound engineer, treated my voice improvisations and created: Heartbeat! George was not known to do this kind of music I trusted however his music taste in really interesting genres and I encouraged him to just do whatever my Voice improvisation and Spoken word Inspired him to do!